In Government, Lavin served as Under Secretary for International Trade at the U.S. Department of Commerce 2005-2007. In that capacity, Lavin served as lead trade negotiator for both China and India and was the senior policy official in the Department responsible for commercial policy, export promotion, and trade negotiations across the globe. Lavin was U.S. Ambassador to the Singapore from 2001-05, where his duties included helping negotiate the U.S.-Singapore Free Trade Agreement. 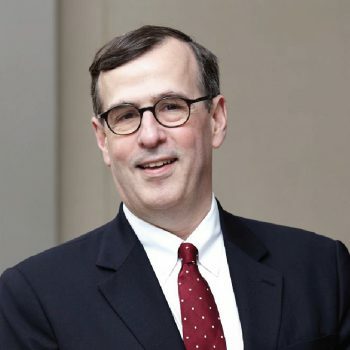 In the private sector, Lavin served in senior finance and management positions in Hong Kong and Singapore with Edelman, Bank of America, and Citibank. Lavin earned a B.S. from the School of Foreign Service (Georgetown); an M.S. in Chinese Language and History (Georgetown); an M.A. in International Relations and International Economics from the School of Advanced International Studies (Johns Hopkins); and an M.B.A. in Finance at the Wharton School (Pennsylvania). Lavin serves as Chairman of the International Council of the National University of Singapore School of Medicine, serves on the Board of Directors of UOB, a regional bank, and on the Board of Directors of Advanced MedTech Holdings, a medical technologies company. He is a Fellow of the Singapore Institute of Directors. Lavin previously served as Steering Committee Chairman of the Shanghai 2010 World Expo USA Pavilion. Lavin served as a Lt Commander in the U.S. Naval Reserves.